Culms: Mostly erect, sometimes bent below, simple or branching, glabrous. Blades: Rolled inward near tip, 2 to 12 inches long, less than 1/6 inch wide, nearly glabrous but often long-hairy on upper surface near base; tips long, narrow. Sheaths: Shorter or longer than internodes, nearly glabrous, tuft of long hairs at throat. Ligules: Rings of very short hairs. 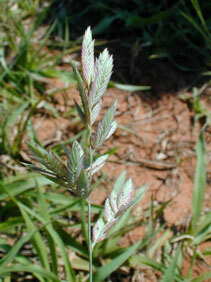 Inflorescences: Panicles, densely flowered, mostly 2 to 6 inches long, often reddish brown; main branches ascending, secondary branches pressed against axis, bearing irregularly arranged clusters of spikelets. Spikelets: Numerous, short-stalked, 5-29 flowered, strongly flattened, 1/4 - 1/2 inch long, less than 1/6 inch wide, reddish; awns absent; glumes nearly equal, tips pointed; lemmas closely overlapping, prominent green nerves, tips pointed and spreading out. Habitat: Dry pastures, prairies, and waste ground, in sandy soils. Distribution: Occurs in the west three quarters of Kansas. Uses: The Paiute used red lovegrass seeds as food.